10.1: Anglicanism, ecumenical engagement and inter-religious dialogue. Two weeks ago [12 March 2015], we saw how the search of Christian Unity was one of the priorities on the agendas of Lambeth Conferences from the very beginning. 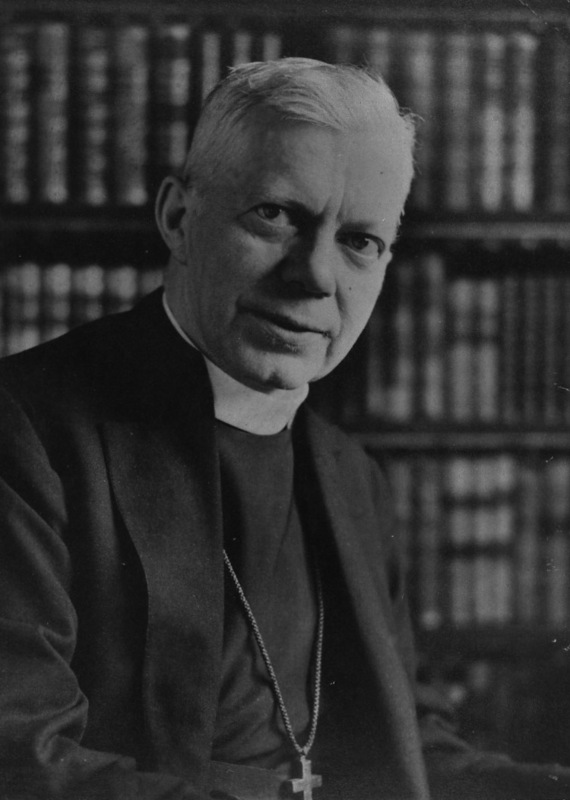 William Reed Huntington was the original thinker behind the Chicago Lambeth Quadrilateral, which became the touchstone for future Anglican endeavours to promote Christian unity. He was the inspiration and principal author of the 1892 revision of Episcopal Church’s Book of Common Prayer. He pursued this revision because he was convinced it would aid the cause of church unity, not only by attention to the patristic sources, but also by the principles of flexibility, adaptability and revisability. His progressive ideas on the role of women in the Church were far ahead of their time, and it was he who established the order of deaconesses in the Episcopal Church. He also helped found the Cathedral of Saint John the Divine in New York City, contributing its iconographic plans and serving as a trustee for 22 years. At the General Convention of the Episcopal Church in 1907, Huntington’s final agenda was revealed in his two-fold proposal to add the Quadrilateral by way of a preamble to the Constitution of the Episcopal Church but also to remove the 39 Articles from their place in The Book of Common Prayer. In the end, both proposals were defeated, and Huntington died within two years at the age of 71, in 1909. Despite Huntington’s feelings of failure, the ecumenical movement as we know it, and real Anglican engagement with it, begins in that first decade of the 20th century. For example, the Week of Prayer for Christian Unity began as the Octave of Christian Unity over a century ago, in 1908, and focused on prayer for church unity. That week owes its origins to one of the earliest and one of the lasting Anglican efforts to promote Christian unity. The concept was first put forward by an Anglican friar, Father Paul Wattson, co-founder of the Graymoor Franciscan Friars. The Society of the Atonement, also known as the Friars and Sisters of the Atonement or Graymoor Friars and Sisters were founded in the US in 1898 as a Anglican religious community by Lurana (Mother Lurana) White and the Revd Lewis (Father Paul) Wattson, with the aim of re-establishing Franciscan life in the Anglican Communion and working for a corporate reunion between Anglicans and Rome. A major part of this effort was the Octave of Christian Unity, and although the Graymoor Friars and Sisters were later received as a body into the Roman Catholic Church, the Week of Prayer for Christian Unity remains part of the legacy of Anglican ecumenical endeavours. 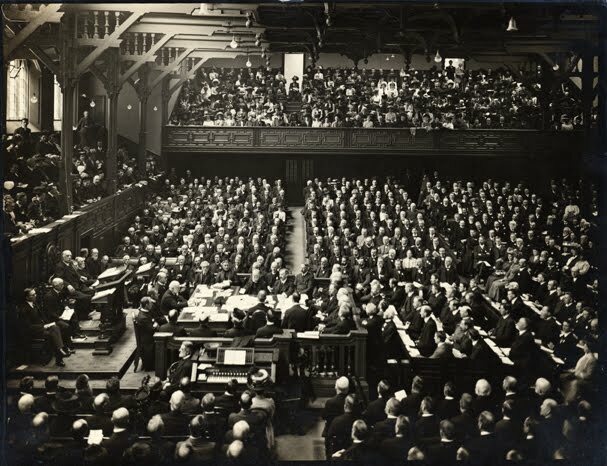 Throughout the 20th century, Anglicans played a prominent role in establishing international ecumenical bodies, and the beginnings of the modern ecumenical movement are normally traced to the World Missionary Conference in Edinburgh in 1910. Three years later, a mission conference drawing together representatives of the Church Mission Society and other evangelical, non-Anglican mission agencies working in Kenya, including Presbyterians, concluded with a joint Communion service in Kikuyu in 1913. It may be difficult to imagine now, but that service stirred controversy, and was condemned, for example, by Bishop Frank Weston (1871-1924) of Zanzibar, who dismissed it as a “Pan-Protestant” communion. For Anglicans, the Appeal to All Christian People issued by the 1920 Lambeth Conference was a seminal step forward towards Christian unity. Interestingly, Bishop Frank Weston was one of the key bishops involved in drafting this appeal, drafters of This appeal was addressed to all those throughout the world who had received Christian baptism, and it invited the Churches to seek unity together. The World Council of Churches (WCC) was founded in Amsterdam 1948 but has a pre-history dating back to the Edinburgh Missionary Conference of 1910. 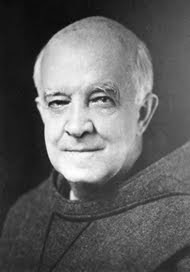 The WCC brought together the work of two international inter-church working groups, ‘Life and Work’ and ‘Faith and Order.’ One of the leading figures in these movements was Bishop George Bell (1881-1958), as Dean of Canterbury (1924-1929) and then as Bishop of Chichester (1929-1958). His international contacts, and his continuing dialogue with Dietrich Bonhoeffer and other Germans Lutherans in the Confessing Church, and with Swedish Lutherans, were a contributing factor towards the setting up of the WCC after World War II. The Church of Ireland and the Methodist Church are members of the WCC. The Presbyterian Church had been a member, but withdrew in 1980. During our Liturgy module, we saw that in the aftermath of Vatican II Pope Paul VI invited a number of outside theologians to meetings of the Commission for the Implementation of the Liturgy Constitution (now the Congregation for Divine Worship), including two influential Anglicans, Ronald Jasper of the Church of England’s Liturgical Commission, and Massey Shepherd, a major architect of the revised American Prayer Book. It is not surprising, then, that throughout the 1970s and the early 1980s, ecumenical dialogue for Anglicans was dominated by the work of the Anglican-Roman Catholic International Commissions (ARCIC 1 and 2), especially their discussions on Eucharistic doctrine. The Eucharist was the first topic discussed by ARCIC, which was co-chaired by Bishop Henry McAdoo of Ossory, later Archbishop of Dublin. In 1971, ARCIC-1 published its first report, the Agreed Statement, or the Windsor Report on Eucharistic Doctrine. The commission said it had reached substantial agreement as to the nature of Eucharistic belief in the two Communions. The second ARCIC statement on the priesthood was reached at Canterbury in 1973. ARCIC also produced a statement on Authority at Venice in 1976. At Salisbury in 1979, ARCIC published elucidations of the first two Agreed Statements in the light of criticisms. An elucidation on the Venice report was published in 1981, and a second statement on Authority was produced at Windsor in 1981. The level of convergence claimed for these agreements was much less than that alleged to have been achieved in the statements on the Eucharist and Ministry. All the Agreed Statements, together with their Elucidations, were collected together in a Final Report in September 1981, and submitted for approval by the Vatican, Roman Catholic hierarchies and Anglican provinces throughout the world. In the agreement, there is no categorical assertion that the Eucharist is a sacrifice, neither has this been excluded. In fact, the whole thrust of the reasoning here is that the Eucharist makes present the once-for-all Sacrifice of Christ here and now. Anglican-Roman Catholic relations have had a shadow cast over them in recent years with the publication of the Apostolic Constitution Anglicanorum Coetibus and the formation of the Ordinariate for Anglican clergy who wish to enter communion with Rome while retaining many aspects of Anglican liturgy and tradition. 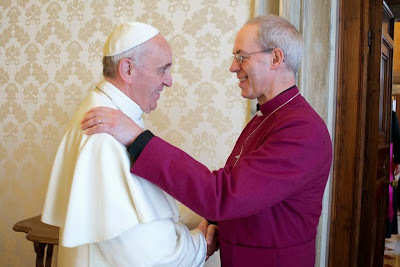 Nevertheless, there appears to have been a very warm and friendly atmosphere when Archbishop Rowan Williams and Pope Benedict XVI met in Rome in 2012, according to reports at the time in the Church Times (16 March 2012, pp 2-3) and the Church of Ireland Gazette (23 March 2012, pp 1, 2), and again when their successors, Archbishop Justin Welby and Pope Francis I, met in Rome in June 2013 and again last year in June 2014. Meanwhile, the Societas Liturgica, founded in 1967 by Anglicans and Roman Catholics, has grown to become the international and ecumenical academy of liturgists, and has been an important forum for co-operation and agreement between Anglicans and Roman Catholics. The first meeting of Societas Liturgica took place at Driebergen in the Netherlands in 1967. That meeting studied the Constitution on the Liturgy of Vatican II and recent work on worship by the Faith and Order Commission of the World Council of Churches. The Very Revd Gilbert Mayes, Dean of Lismore, was elected the first secretary. The second congress was held in Glenstal Abbey, Co Limerick, in 1969, and since then Societas Liturgica has met at two year intervals, meeting in Dublin in 1995. Most of the papers delivered at meetings of the Societas have been published in English in Studia Liturgica. There are now more than 400 members of Societas Litugica. The international and ecumenical character of the society is illustrated by the list of its successive presidents and council members, including many Anglican liturgists such as Gray, Jasper and Bradshaw. The last Congress of Societas Liturgica was held in Würzburg, Germany, two years ago summer [5-10 August 2013]. The XXV Societas Liturgica Congress takes place in Quebec, Canada, on 10-15 August 2015. The International Anglican Liturgical Consultation, which began in 1983, meets every two years at the same time as Societas Liturgica, with the active participation and engagement of ecumenical partners. The Faith and Order Commission of the World Council of Churches has also encouraged ecumenical conversation and convergence on the liturgy with the publication of the document Baptism, Eucharist and Ministry (Lima, 1982). This liturgy was strongly influenced by the ecumenical community at Taizé, and particularly by the Sub-Prior of Taizé, Max Thurian, and his interest in a diverse range of liturgical traditions, from the French Reformed to the Eastern Orthodox. 5, The Eucharist as Meal of the Kingdom. But the Church of Ireland, as we shall see in our next session, is also part of a closer communion of churches, which is emerging in Northern Europe and which is being referred to increasingly as the Porvoo Communion – a grouping of more than a dozen Anglican and Lutheran churches in these islands, Scandinavia and the Baltic states. The Anglican interest in the (Episcopal) Church of Sweden can be traced back to the Oxford Movement in the 1830s and 1840s. Prior to the first Lambeth Conference of 1867, Charles Kingsley and others were urging the Archbishop of Canterbury to invite the bishops of Sweden to the conference. 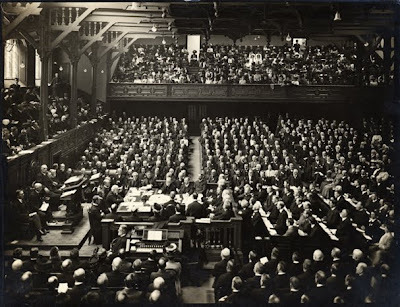 The Lambeth Conference of 1920, although it avoided the term “inter-communion,” agreed to a series of special relations with the Church of Sweden, including mutual participation in Episcopal consecrations. 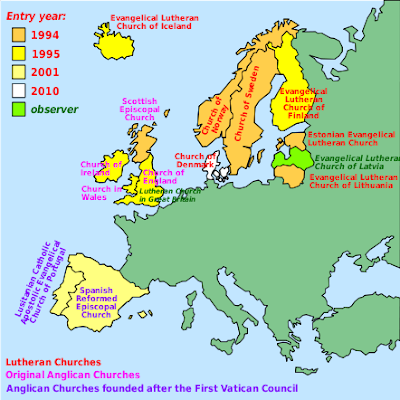 And so when, for the first time, the Church of Sweden formally came into a closer relation with another church it was, strangely enough, not with another Lutheran Church, but with the Church of England. And, although there is now full communion between the Church of Sweden and the Church of Ireland and other Anglican churches, there are still tensions between the Church of Sweden and those Lutheran churches it sees as not having preserved the historic episcopate. The ordination of women in Sweden threatened to rock this relationship in 1959 and 1960, but it was resumed in 1976, and it has been the bedrock on which the Porvoo Agreement is founded. 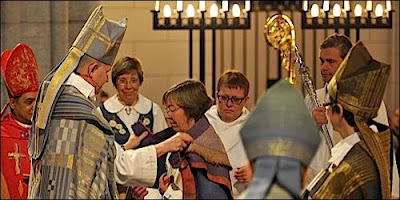 New tensions arose five years ago with the election in May 2009 of Eva Brunne as Bishop of Stockholm, and her consecration in November that year. She lives in a registered partnership with another woman, and has an eight-year-old son. The Porvoo and Meissen agreements are similar to the agreements reached between the Episcopal Church of the United States (TEC) and the Evangelical Lutheran Church of America (ELCA), the Waterloo Agreement between Canadian Anglicans and Lutherans, and similar agreements between Anglicans and Lutherans in other countries. Today, Anglican and Lutheran bishops share mutually in episcopal consecrations in Europe, Africa, Asia, the Middle East and many parts of the Americas. The Porvoo Agreement may provide the basis for further developments in the Meissen Agreement between the Anglican Churches in these islands and the Evangelical Church in Germany (EKD), which was signed in 1988. The Meissen Agreement was signed only by the Church of England, but it may provide a basis for deepening the relations between the Anglican churches of these islands and the German Protestants, who are grouped in Lutheran, Reformed and United churches. It commits the churches to “share a common life and mission” and to “take all possible steps to closer fellowship in as many areas of Christian life and witness as possible,” by committing their churches to encourage partnerships and exchanges at all levels of church life, and on the part of theological colleges and specialist agencies. Exchanges of ministers, church workers and students are also to be encouraged. It does not achieve full inter-changeability of ministers, but it does agree on mutual Eucharistic hospitality and encourages attendance at each other’s ordinations. The Reuilly Agreement, signed in 1997 and approved by the General Synod of the Church of England in 1999 and the General Synod of the Church of Ireland in May 2000, links the four Anglican Churches on these islands and the French Lutheran and Reformed Churches, acknowledging one another’s churches and looks forward to a fuller visible unity. The eight participating churches are four Anglican churches of these islands (England, Ireland, Scotland and Wales); and the four French churches of the Lutheran and Reformed traditions: the Church of the Augsburg Confession of Alsace and Lorraine, the Evangelical Lutheran Church of France, the Reformed Church of Alsace and Lorraine and the Reformed Church of France. It dates back to visit to Strasbourg in 1989 by Archbishop Robert Runcie of Canterbury, when the French Reformed and Lutheran Churches signalled their desire to enter into closer fellowship with Anglican churches on the model of the Meissen Agreement. Welcoming this approach, the Anglican side felt a new relationship with the French churches ought to be built on long, historical links between the churches. Those links include the story of the arrival of the Huguenots in Ireland following the Revocation of the Edict of Nantes in 1685. The continuing theological and other work done by the Meissen Commission and the Porvoo churches offered a structure and resources for the Anglican/French conversations, which began formally in 1994, and were completed by 1997. In the 17th and 18th centuries, there were a number of attempts to open dialogue between Anglicans and the Orthodox traditions, most notably the establishment of a Greek college in Oxford, and the attempts at dialogue between the Nonjurors and the Ecumenical Patriarchate. However, modern dialogue between the Anglican and Orthodox traditions begins in 1962. 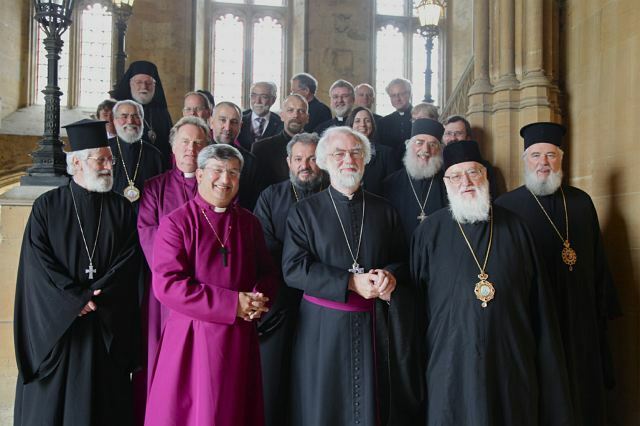 Following the talks that year between the Archbishop of Canterbury, Dr Michael Ramsey, and the Ecumenical Patriarch, Athenagoras I of Constantinople, the Primates of the Anglican Communion agreed unanimously to set up an Anglican Theological Commission to confer with theologians of the Orthodox Churches. In 1964, the Third Pan-Orthodox Conference at Rhodes unanimously decided officially to resume dialogue with the Anglican Communion, and this was ratified by all the Orthodox Churches. After a preparatory phase (1966-1972) in which the Anglican and Orthodox Commissions met separately, the first series of joint conversations took place (1973-1976). In 1973, the Anglican-Orthodox Joint Doctrinal Discussions (A/OJDD) met for the first time in Oxford. This first phase resulted in the Moscow Agreed Statement (1976) on the Knowledge of God, the Inspiration and Authority of Holy Scripture, Scripture and Tradition, the Authority of the Councils, the Filioque Clause, the Church as the Eucharistic Community, and the Invocation of the Holy Spirit in the Eucharist. Following the 1978 Lambeth Resolution 21 on the ordination of women, the Orthodox Co-Chairman of AOJDD, Archbishop Athenagoras, expressed his view that “the theological dialogue will continue, although now simply as an academic and informative exercise, and no longer as an ecclesial endeavour aiming at the union of the two churches”. He later recommended that Orthodox professors rather than bishops should take part in the dialogue as an indication of its changed status and purpose. Some Orthodox agreed with this. However, as the Bishop of St Albans discovered during his visits to the Orthodox Churches in the spring of 1979, other Orthodox felt there was no need to change the standing of the talks and wished the dialogue to be. The steering committee of AOJDD met in July 1979 and agreed that the full commission should continue its work in July 1980. “The ultimate aim remains the unity of the Churches,” it affirmed. In Odessa in 1983, the commission gave particular to Primacy (Seniority); Witness, Evangelism, and Service; and Prayer, Icons, and Family Devotion. The 1984 meeting at Bellinter, Co Meath, agreed on a report and statements on “The Mystery of the Church,” “Faith in the Trinity, Prayer and Holiness,” and “Worship and Tradition.” The publication after this meeting of the Dublin Agreed Statement (1984) concluded the second phase. Both statements recorded a measure of agreement on specific topics, while acknowledging continuing divergence on others. The third phase of this dialogue began in 1989, when the commission was re-constituted as the International Commission for Anglican-Orthodox Theological Dialogue (ICAOTD), chaired by Metropolitan John of Pergamon and Bishop Henry Hill (and later by Bishop Mark Dyer), drawing together senior clergy and theologians from the Orthodox Churches and the Anglican Communion. It has considered the doctrine of the Church in the light of the doctrine of the Trinity, and examined the doctrine of the ordained ministry of the Church. It has given particular attention to the question of who may be ordained to the presbyterate and the episcopate, to ecclesiological issues and to aspects of Trinitarian doctrine. The publication of The Church of the Triune God: The Cyprus Agreed Statement (2005) concludes the third phase of the Anglican-Orthodox international theological dialogue. The statement sets out significant material on the life of the Church which is timely and pertinent to many of the current debates within Anglicanism. It was sent for consideration to the Lambeth Conference in 2008. Archbishop Richard Clarke is a member of the International Commission for Anglican-Orthodox Theological Dialogue (ICAOTD), which met at the University of Chester on 3-10 September 2012, to continue the commission’s in-depth study of Christian anthropology, particularly in regard to what it means to be a human person created in the image and likeness of God. 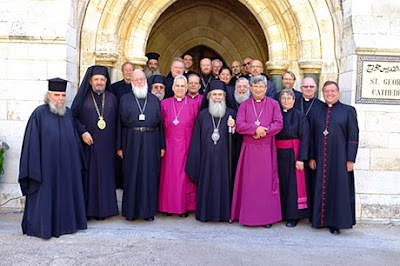 The Commission met most recently in Saint George’s Anglican Cathedral, Jerusalem, last year [17 to 24 September 2014], and meets again later this year at an Orthodox venue. Understanding the relationship between Christianity and other religious traditions has been important since the beginnings of the Church – indeed, Christianity itself came out of the Jewish tradition. The starting point for inter-faith dialogue can be our common humanity, the need in a plural world to work together for common human ends, and the need for neighbourliness. It was with this understanding that the Lambeth Conference in 1988 called on Anglicans to strengthen their relationships with people of other faiths, through dialogue built on mutual understanding, respect and trust. Such makes it possible for Christians to share with others in service to the community, and can become a medium of authentic Christian witness. In parts of the Anglican Communion, such as Nigeria, Sudan, Pakistan and parts of the Middle East, some sections of other faith communities are persecutors of Christians. Where this is the case, dialogue with the dominant faith group may still be possible. But Christians must also be prepared to engage in advocacy on behalf of fellow Christians in difficult situations. This is why the 1998 Lambeth Conference resolved to “respectfully ... request the governments of nations where such discrimination and harassment are common occurrences to affirm their commitment to religious liberty.” The bishops also asked all Anglicans to support persecuted Christians by prayer, encouragement, and practical and economic assistance. With an increasing number of attacks by extremist religious groups on faith traditions around the world, there has perhaps been no better time for members of the Anglican Communion to actively dialogue with members of other faith traditions who hold common values of promoting peace, social justice and religious liberty. There is a difference not just in terms of expectations, but in understandings, between inter-church dialogue and inter-faith dialogue. ● Progress towards genuinely open and loving relationships between Christians and people of other faiths. ● Exchange of news, information, ideas and resources relating to inter faith concerns between provinces of the Anglican Communion. ● Local contextual and wider theological reflection. ● Witness and evangelism where appropriate. ● Prayerful and urgent action with all involved in tension and conflict. ● Support for people of faith, especially Christians, who live as religious minorities in situations of discrimination or danger. ● Gathering information through its international presidents, management group, correspondents, and contacts support groups. NIFCON has also been charged by the Lambeth Conference to study and evaluate Muslim-Christian relations and to report regularly to the Anglican Consultative Council. 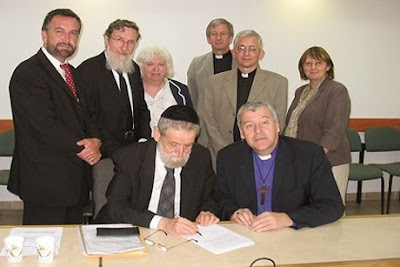 ● The Agreement between the Chief Rabbis and the Archbishop of Canterbury. ● The declarations at Alexandria, Bali, Cairo, Islamabad and Kaduna. ● Bangalore (India), 2003, a South Asian consultation on ‘mission and dialogue’ that stressed the importance of engaging in trustful and respectful inter-faith dialogue while vigorously advocating the cause of minorities suffering religious oppression. ● Oslo (Norway), 2003, when Anglicans and Lutherans from the Porvoo Communion highlighted the need to maintain the integrity of the church’s ministry while enabling the pastoral care of the other. ● Kaduna (Nigeria), 2007, a meeting in the Christian and Muslim setting of West Africa, a consultation on ‘faith and citizenship’ that pointed to the challenge of witnessing persuasively to the Gospel while welcoming fellow citizens of other faiths as co-workers for the common good. ● Lambeth Palace (December 2011), marking a century of Anglican interfaith engagement and celebrating the life and work of the late Bishop Kenneth Cragg, the Anglican pioneer in the field of dialogue with Islam. When he was Archbishop of Canterbury, Dr Rowan Williams signed a Joint Declaration with the Chief Rabbis of Israel, Chief Rabbi Shlomo Amar and Chief Rabbi Yonah Metzger, on 6 September 2006, setting out a framework for continuing Anglican-Jewish dialogue. 1, First, the meetings of the Principals (the two Chief Rabbis of Israel accompanied by The Chief Rabbi of Haifa, Shear Yashuv Cohen, and the Archbishop of Canterbury accompanied by Archbishop Michael Jackson) who receive and discuss the work of the Anglican Jewish Commission and provide subject matter for future Commission meetings. 2, The Commission itself, chaired by Archbishop Michael, which looks in greater depth at matters of current mutual interest and concern from the perspective of Jewish and Christian writings, scripture and theology. Ian Ellis, Vision and Reality: A Survey of 20th Century Inter-Church Relations (Belfast: Institute of Irish Studies, 1992). Eric Gallagher and Stanley Worrall, Christians in Ulster: 1968-1980 (Oxford University Press, 1982). Michael Hurley (ed), Irish Anglicanism 1869-1969 (Dublin: Allen Figgis, 1970). Brendan Leahy, Inter-Church relations – a tribute to Bishop Anthony Farquhar (Dublin: Veritas 2008). Alan Megahey, The Irish Protestant Churches in the Twentieth Century (Macmillan Press, 2000). Norman W Taggart, Conflict, Controversy and Co-operation: The Irish Council of Churches and ‘The Troubles,’ 1968-1972 (Dublin: Columba, 2004). Peter Thompson, Working out the covenant: the story so far (Dublin: Church of Ireland Publishing, 2007). 11.1: Is there an Anglican culture? Anthony Trollope and the Barchester novels. 10 a.m., 11.2: Is there an Anglican culture? The poetry of TS Eliot. (Revd Canon Professor) Patrick Comerford is Lecturer in Anglicanism, Liturgy and Church History, the Church of Ireland Theological Institute. This is an expanded version of notes prepared for a lecture on the MTh Year II course, TH 8825: Anglican Studies in an Irish context, on Thursday 26 March 2015.